The latest updates from our development team. You can also subscribe to our updates mailing list. Today we have released the ability to view the balances for any of your portfolios on a specific date. This is similar to Trial Balance functionality in accounting software. When viewing your Balances, select the Report Options dropdown, select the date that you would like to view, and click Update to refresh the report. You will be presented with a Balances report for your portfolio as if you had viewed the report at the start of that day. Note that your calculated portfolio history will only go back to the date 24 months before you originally signed up with CryptFolio. If you need to view history further back, you will need to upgrade your plan. You can also view the individual account balances that make up the portfolio balances on a specific date as well. When viewing the Currency Balances report for a given currency, select the Report Options dropdown, select the date you would like to view, and click Update to refresh the report. Thanks to Andrew for the suggestion! 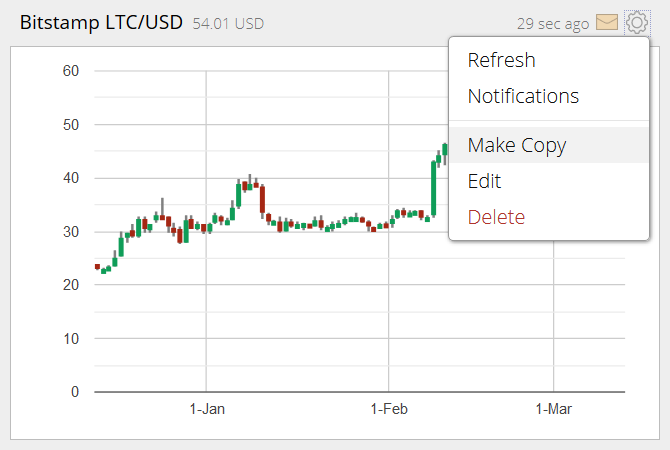 Today we have released a little improvement allowing you to directly clone or make a copy of a chart in your portfolio. Select the Options menu using the top-right gear icon, and select Make Copy. The chart will have the same properties, parameters, and technical indicators as the original chart, and will be placed at the end of your portfolio. Today we have updated the CryptFolio API to include a read-only endpoint for viewing your inventory balances for each portfolio. Your inventory balances are the sum of all transactions in your portfolio, that have a transaction type of purchase or sale. In order for your tax reports to work correctly, your inventory balance should equal your portfolio balance. 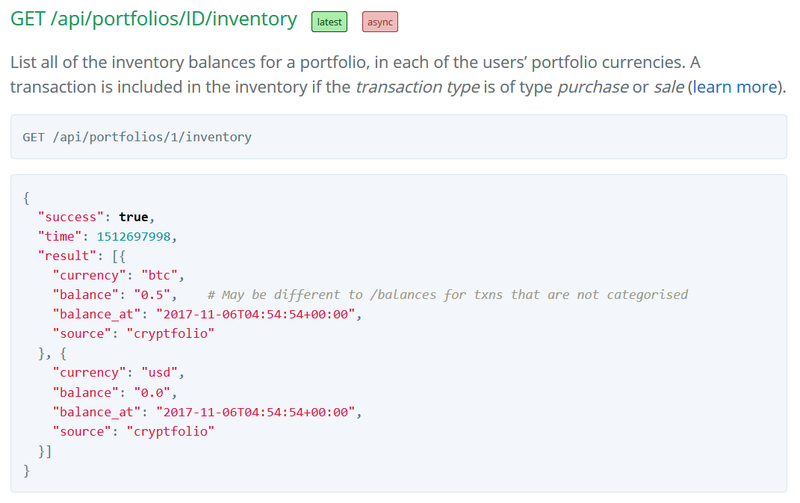 This API endpoint is identical to the information you will see if you visit your Portfolio > Balances. For more information about how we use transaction types to calculate your tax reports (such as FIFO), check out this article, or review the updated API documentation. Today we have released a fix so that deprecated exchanges won't be included in any exchange rate notifications that you may have set up. This should greatly improve the quality of the exchange rate notifications that you receive. You can browse the list of deprecated exchanges – exchanges which are no longer active, or those that generate inconsistent data – on our exchanges list. Over the last few weeks we have added support for tracking all ~17,000 exchange pairs supported by CoinGecko, and this data is now live and available for your reports. This brings our supported currencies to over 5,000!